Bedtime becomes a magical time with this enchanting unicorn lamp. 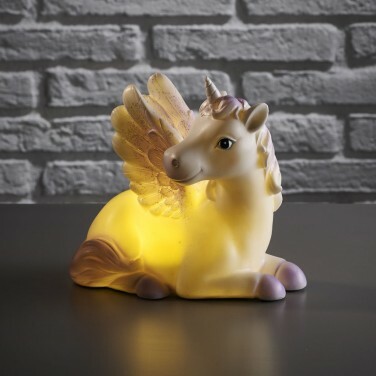 Complete with glittered wings and a unicorn horn this unicorn is lit by white LEDs for a warm comforting glow. USB or battery operated, this fairytale lamp can be placed anywhere in your child's room for the reassurance of light at night, casting just the right amount of light to comfort without disturbing sleep.